Trouble Brewing is a multiplayer game that pits players against players in a build 'em up, knock 'em down style competition to see who can brew rum the fastest. Players rush to gather materials used to make rum with while, at the same time, trying to prevent the opposing team from doing so. At the end of each game, players are rewarded with experience in a variety of skills and pirate currency known as Pieces o' Eight. This Activity is considered "safe," which means that you can’t die while playing it unless you were poisoned prior to the start of the game. Because there is no way for you to easily recharge your run energy, you want to weigh as little as possible while still carrying the essentials to succeed. Since you may not have anything in your inventory prior to the start of the game, here's what you should have on you. 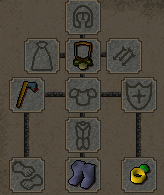 M'speak Amulet - Obtained from the Monkey Madness quest, this enables you to talk to monkeys. Its use is explained in more detail in the "The Different Roles" section below. This item is not absolutely necessary. Rune axe - Your standard axe for chopping trees, you don't have to bring this either. You can always opt to go with a bronze axe that you can obtain during the game; however, you won't chop as fast. Its use is also explained later in more detail along with the M'speak amulet. Boots of Lightness - Obtained from the Temple of Ikov quest, this nifty pair of footwear lowers your weight by 4 kg. Very useful as it enables you to run around longer before your run energy hits 0 percent. Of course, it's not absolutely necessary, but this item is highly recommended. Ring of Duelling(x) - You can use this ring to teleport away from the brewery after you're done playing this Activity. Since you can't carry anything in your inventory and you should be wearing an M'speak amulet if you have one, this item is the fastest way to put some distance between you and those scurvy pirates without too much hassle. Bring one of these unless you enjoy partying with the horrors of the jungle. Teleport to the Ectofuntus using an Ectophial obtained during the Ghosts Ahoy quest. Follow the green path to the dock. Teleport to Canifis using Ancient Magicks or a Kharyll Portal within your house. Teleport to Varrock in whichever way you would like. 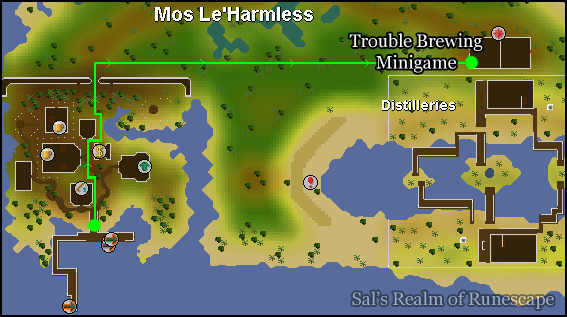 Follow the green path to the Temple with Monks of Zamorak. If you have level 65 agility, you can take the shortcut through a fence to skip the Paterdomus Dungeon. If you don't have level 65 agility, make your way to the exclamation point and climb down the ladder. Follow the path that you traveled in the Priest in Peril quest and you'll wind up on the other side of the fence. Follow the Canifis route to the dock. Once you get there, follow the green route as detailed below to get to the Activity. 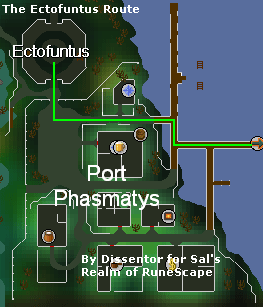 You can also charter a ship to take you to Mos Le'Harmless for a reasonable fee at most major ports all around RuneScape. The game lasts 20 minutes long at most, just like Castle Wars and Pest Control. The object of the game is to finish with more bottles of rum brewed than the other team when the 20 minutes is over. If you are on Fancy Dan's team, you will get a fancy little pirate hat, just like Dan's. If you are on San Fan's team, you will get a, erm, "Sanfanesque" pirate bandanna, just like San Fan's. If you couldn't care less about which team you're playing on as long as you get to play, walk to the center of the waiting room building. There you'll find Honest Jimmy. 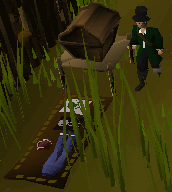 He runs a Deposit Box, a store for navy and pirate garb, and allows you to join the team with the lower amount of people waiting, just like the Guthix portal in Castle Wars. While loitering in the Waiting Room, you'll see a banner in the form of a scroll. It will tell you exactly how many people are waiting to play on each team and how much longer until the next game. ... then it would probably be a good idea to find another world to play in. The banner is telling you that there are currently no games in progress and not a soul in sight willing to lend a hand or hook to brewing rum. The above indicates that you are the only one waiting to get into a game, but there is currently a game in progress and that there are 18 minutes out of 20 left. Same thing as the banner before this one, but this time, there are only 9 minutes left in the game. The actual game interface is far more complex. It will be explained in detail below. 1 - This indicator shows how many logs are currently present and being used in Boiler #1. When the number turns green, that means that the boiler is currently at the correct temperature. Logs are consumed at a rate of one log per minute and they will need to be constantly replaced. 2 - This indicator shows how many logs are currently present and being used in Boiler #2. 3 - This indicator shows how many logs are currently present and being used in Boiler #3. 4 - This indicator shows how many bitternuts have been deposited in the bitternut hopper (explained below). When the number turns green, that means that there are enough bitternuts (1 or more) to brew one bottle of rum. 5 - This indicator shows how many loads of sweetgrubs have been deposited in the sweetgrub hopper. When the number turns green, that means that there are enough loads of sweetgrubs (1 or more) to brew one bottle of rum. 6 - This indicator shows how many buckets of water have been deposited in the water hopper. When the number turns green, that means that there are enough buckets of water (5 or more) to brew one bottle of rum. 7 - This indicator shows how many bowls of colored water have been deposited in the colored water hopper. When the number turns green, that means that there are enough bowls of colored water (3 or more) to brew one bottle of rum. 8 - This indicator shows how many loads of scrapeytree bark have been deposited in the scrapeytree bark hopper. When the number turns green, that means that there are enough loads of scrapeytree bark (1 or more) to brew one bottle of rum. 9 - This indicator shows how many of your team's hoppers have been damaged by fire. They will need to be repaired with lumber patches before they can be used to deposit resources again. 10 - This indicator shows how many of your team's trees are currently on fire. Trees that are burning will need to be doused with a bucket of water until you can continue to obtain logs from them. If you just let them burn themselves out, it'll take longer for them to regenerate than if you had chopped them down. 11 - This indicator shows how many tiles on your team's bridges have been damaged by fire. Bridge tiles that have been damaged by fire cannot be walked upon, rendering the whole bridge useless. They will need to be repaired with bridge sections before they can be used again. 12 - This indicator will flash if a bottle of rum that you contributed to (deposited enough of one ingredient to make a bottle of rum, i.e. 5 buckets of water, 1 bitternut) has been successfully brewed. You and whoever else contributed to its production have one minute to pick it up and put it in the rum crate before the next bottle of rum (if enough resources are queued up to produce it) comes out on the conveyor belt and knocks the previous one to the floor, causing it to smash. 13 - This indicator shows the current score and how much time is left before the game is over. From left to right, the hoppers are colored water, scrapey bark, sweetgrubs, and bitternuts. Each ingredient must be placed in the corresponding hopper to be added to the stockpile. The one lone hopper that's off to the side is for buckets of water. The fastest way to get from your base to the opponent's base is by crossing your bridge to get to the center island and then crossing the opponent's bridge to get to their base. If either bridge has been damaged and rendered impassable, then you can take one of the side bridges to get to the other side. If you want to get to the center island, but your own bridge has been damaged, cross a side bridge to get to one of the side islands and then use the stepping stones (marked in brown solid lines) to get to the center island. If all the bridges have been damaged in some way, shape, or form, then you can use the stepping stones on the far sides of the distilleries. You can get from one side to the other as well as to the side islands using the stepping stones. In short, the stepping stones are great for getting around if the bridges have been sabotaged and you're too lazy to go repair them, but the stones take a lot longer to cross. As mentioned before, Trouble Brewing is a team game. You won't be able to brew rum competitively by yourself - as a matter of fact, you need at least three people per team to even play. Therefore, members of your team will need to concentrate on doing only a few tasks to maintain peak efficiency. If you're thinking that this is like Henry Ford's assembly line, give yourself a pat on the head (not back, to avoid a clichè). Below you may find specialized roles that you can engage in. Gathering bitternuts takes much longer than the other supplies, but it is vital to the team effort to have enough bitternuts. It is helpful if more than one member of the team works at gathering bitternuts to ensure a healthy supply of them. The following steps should give you a general idea as to how to efficiently gather bitternuts. You don't absolutely have to do it this way. It's just what I have found to work best after some experimenting. 1. As soon as the game starts, run to the tool store table and grab five bowls, two bridge sections, and a bucket. The bridge sections and the bucket are used in the unfortunate event that some bilge water-drinking scumbag from the other team happens to set your bridge on fire, delaying you in your quest for those nuts that are bitter. Since gathering bitternuts does not take up much of your inventory space, you might as well grab a few bridge sections and a bucket. 2. Go to your water pump and fill up your bucket with some dihydromonoxide (water). 3. Head over to the opponent's base and pick five flowers of your color. Five is the maximum amount of flowers you can pick by yourself at any given moment. 4. Return to your base and throw the flowers into your kettle. 5. Use your bowls on the kettle. They will now be filled with steaming hot water of your team's color. 6. Go to the center island and nab two monkeys. You can only have two monkeys in your inventory at once. 7. Use a bowl of water on each monkey and pray that singed monkey fur doesn't smell too terribly. The monkeys will now be marked with your team color. 8. Use one of your monkeys on a bitternut tree. Once it's up there, you'll be able to see its tail wagging at the top of the tree. This is where the M'speak amulet comes into play. You can choose to make your monkey angry or tell it to be cautious. Although there is no definitive answer to the question of what exactly does each "encouragement" do, there are some theories. In my experiences, if you choose to make your monkey angry, it will be less likely to win fights (see below) but will gather a nut faster. If you tell it to be cautious, it's more likely to win fights, but gathers a nut slower. 9. If your monkey is successful in obtaining a bitternut, it will throw it down to you and run off. If an opponent sends a monkey of the opposite color up the same tree that your monkey is in or vice versa, the two monkeys will fight. The fight outcome is random, but you can increase your chances of winning by making your monkey cautious prior to sending it up a bitternut tree. If your monkey wins the fight, it will throw you a bitternut. If your monkey loses the fight... well, it's not in much condition to throw you much of anything anymore. 10. Repeat this process so that you have two bitternuts, which is the maximum that you can gather at one time. 11. Climb the copper ladder in your base to access the hoppers and deposit your two bitternuts in the correct hopper. 12. You should have three bowls of colored water remaining. Repeat steps 7 - 9 one more time, then start the whole process over again. Total possible experience gained per task: 100 crafting, 330 cooking, 150 firemaking, 15 agility. When it comes down to it, a team really only needs one person doing this task. 1. As soon as the game starts, run to the tool store table and fill your inventory with 28 pieces of rat meat. 2. Head to whichever sweetgrub mound you prefer. 3. Use all 28 pieces of rat meat with the sweetgrub mound. There are three possible outcomes. The first one, the most desirable one, is the rat meat gets used up and a load of sweetgrubs appears where that piece of rat meat used to be. The second one, which is less desirable, is the same as the first one, except the mound becomes devoid of sweetgrubs. You will need to wait approximately 16 seconds (yes, I timed it) before the sweetgrub mound is usable again. The third outcome, the one that you hope doesn't happen very often, results in the appearance of a swarm of angry sweetgrubs. They are just like the swarm random event. You need to run off for a short distance and wait for the angry sweetgrubs to disappear before you can continue to gather sweetgrubs. 4. You will end up with 28 loads of sweetgrubs minus however many angry sweetgrubs you got. Deposit them all in the correct hopper. Total possible experience gained per task: 100 crafting, 290 cooking, 150 firemaking. When it comes down to it, a team really only needs one person doing this task. Be warned however, doing this task may result in catching the "sickies" first experienced in the Zogre Flesh Eaters quest. 1. As soon as the game starts, run to the tool store table and take a knife. If you didn't bring a rune axe with you, take a bronze axe from the workbench as well. However, as you probably know, you won't chop as fast with a bronze axe. 2. Head to whichever scrapey tree you prefer. Please do note that the ones closest to your base are probably the ones that are the most crowded. 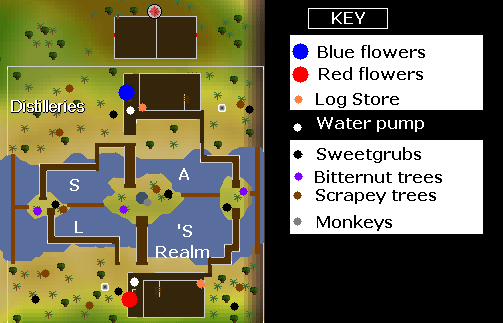 The scrapey tree on the center island is recommended. 3. Chop at the tree to get scrapey tree logs until the tree falls. 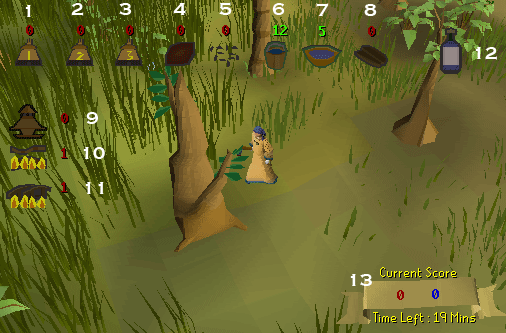 When it falls, instead of wasting time waiting for it to respawn, use your knife on the logs to get scrapeytree bark. This is the part that might cause you to become diseased. This disease, first experienced in the Zogre Flesh Eaters quest will cause your stats to drop at random by a few levels at a time. Your health will never be affected. You can cure this disease by drinking a dose of Relicym's Balm. 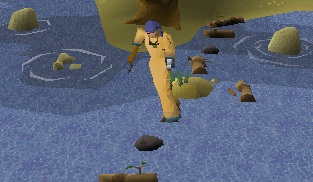 Wearing slayer gloves will prevent you from getting diseased. 4. Once you have 27 logs/bark (inventory full), convert the rest of the logs to bark using your knife. 5. Deposit them all in the correct hopper. All I can say is that this role is quite boring and tedious. Some people find it enjoyable though. Whatever floats your boat I guess. 1. Do steps 1 - 5 under Bitternut Gatherer. 2. Deposit the bowls of colored water in the correct hopper and repeat steps 1 and 2 until you are bored out of your mind. Total possible experience gained per task: 33.3 (repeating) crafting, 123.3 (repeating) cooking, 50 firemaking. This role is very tiring on your mouse hand and wrist and gives you absolutely no experience whatsoever. However, you can get a lot of pieces of eight from this role. 1. As soon as the game starts, run to the tool store table and take 28 buckets. 2. Go to the water pump and fill all 28 buckets. 3. Deposit them in the correct hopper and repeat steps 1 - 3 until your wrist breaks or the game ends. Normal logs are vital to keeping your still in functioning condition and to heat the boilers. May the logs be with you! 1. If you have a rune axe, you don't need to get anything from the tool store table when the game starts. Otherwise, take a bronze axe. 2. There are trees scattered all over the island, including one on the center island. Chop them down for normal logs until your inventory is full. 3. Don't put them in the boilers just yet because there's no point in keeping the boilers burning if there aren't enough resources to start brewing rum. Instead, drop them off in the log store and go back to chopping. 4. Once you see in the HUD (heads up display)/game interface that there are enough resources to begin brewing rum, take the logs and put them in the boilers. 5. After there are at least three logs in each boiler, take a tinderbox and light the boilers. Keep feeding the boiler fires with logs, making sure that each boiler has more than three logs at all times. The maximum is 10 logs. 6. If all boilers are maxed out on logs, either switch to another role or continue to fill up the log store for continued fueling of the boiler fires and assisting the repairmen and women. With this role, you are now able to live out your dreams in fantasy land! This role is very enjoyable, fun, and entertaining as long as you don't mind being called a "noob" a lot. 1. As soon as the game starts, run to the tool store table and grab a tinderbox and a torch. 2. Make your way to the opponent's base. Run if you can, because speed is of the essence. 3. Light your torch(es) once you're halfway to the opponent's base by using your tinderbox with an unlit torch. 4. Your first target should be the opponent's water pump. Keep using a lit torch on the water pump until it catches on fire. If an opponent repairs it, try to set it on fire again. If the opponent calls you a noob, say something witty back at them, like, "I know I am" or "Thanks for the compliment!" 5. Next, you should try to burn the opponent's hoppers to slow them down. 6. When both teams have started to produce rum, usually around the 14th minute or so, start torching the opponent's bamboo pipes that connect the boilers to each other. 7. When one torch goes out, go back to your base and get another one and repeat the "glowing" experience. Don't you just love the originality of the title of this role? 1. As soon as the games starts, run to the tool store table and grab five buckets, five bamboo pipes, five bridge sections, and five lumber patches. 2. Go to the water pump and fill up your five buckets. 3. Pay close attention to the part of the HUD/game interface that's on the left side of the screen, the side that tells you what's on fire and what's not on fire. 4. Whenever anything is on fire, go put it out with a bucket of water. Then use the appropriate materials to repair the damage. 5. When you run out of water, go fill up at the water pump again. If the water pump is burned out or on fire, either use a bamboo pipe with it or go fill a bucket at the watering hole in the center island, respectively. 6. If you run out of stuff to repair things with, grab logs from the log store where there are hopefully a few logs, and use them on the workbench to make more repair supplies. 7. If your opponents are starting to gang up hard on your bamboo pipes that connect the boilers, pump the large steam pump a few times and then vent it to put out all the bamboo pipe fires and deal some damage to any opponent standing next to the pipes. However, it will inflict an extra stage of damage (there are five stages of damage that flammable items can take) on those pipes, so be careful and use the large steam pump wisely. The above image depicts the large steam pump on the left side. In the center is a boiler. In front of the boiler is a small wooden sign telling you which boiler it is (1, 2, or 3), and the blackened objects are bamboo pipes that have been damaged. Total possible experience gained per task: 12.5 crafting, 50 firemaking (for putting something out and repairing it), 12.5 crafting (for making repair supplies), 10 strength (for pumping the large steam pump). The great thing about this game is that, win or lose, you will still get rewarded for your rum brewing efforts. This makes Trouble Brewing much more worthwhile time-wise, unlike in Castle Wars, where you don't get anything besides the combat experience you earned in-game if your team doesn't win. The experience rewards are listed under each main role above. After every game, you will gain 100 crafting exp, 250 cooking exp and 150 firemaking exp for every bottle of rum produced that you contributed resources for. To qualify for this reward, you must have contributed one of the following (1 scrapey bark, 1 bitternut, 1 sweetgrubs, or 3 colored water) and your team must have brewed at least one bottle of rum. The best way to max out this experience is by gathering sweetgrubs or scrapey bark. Since your team's average rum output is, on average, 12 - 16, and probably won't exceed 20 bottles of rum brewed in a game, one trip will ensure that you get rewarded with experience for every single bottle of rum that is brewed. The other reward in Trouble Brewing is a new pirate currency known as "Pieces of Eight", also known as PoE. PoE is used to buy items from Honest Jimmy's store, located just north of the waiting room. For every single bottle of rum your team has brewed, you will get two PoE. You will also get up to 100 additional PoE per game based on how hard you have toiled. For every single "task" that you have undertaken, you will gain one PoE. A task is not just feeding supplies into the hoppers. Sabotaging and repairing count as a task as well for PoE reward purposes. Honest Jimmy likes to play by the caveat emptor mantra, in other words, let the buyer beware. Once you pay for something, there are absolutely no refunds and you're stuck with your contraband purchase. The clue scroll that you can buy for 500 POE is a level 2. The rum can be used to teleport to the Activity by consuming said rum. And that's all there is to it. Happy brewin' and hope to see you mannin' the hops on World 104, the best one to find a game of Trouble Brewing.